September 17, 2011  Bowling Green Triangle, NYC: Hundreds are gathered at 10 a.m. around the bronze bull. Hundreds of NYPD officers of all stripes look on. Hundreds of tourists riding double decked buses down South Broadway snap pictures and roll video. An "illegal" read: non-permitted protest is off to a good start by refusing to be fenced in the official protest area. Beginning at 10 a.m. thousands of protesters took to the streets of lower Manhattan to mount a sustained effort to organize against a financial system that they say favors the wealthy and powerful at the expense of 99% of Americans. It was not, however the 20,000 strong action the organizers set as a goal. The NYPD did not release an official count of the number of protesters; neither did it list the protest or the closure of all streets leading to the New York Stock exchange in its daily NYC traffic advisory. This never happened and is officially still not happening. The organizers wanted to start with 20,000. By my unofficial estimate they got somewhere between 3,000 - 5,000 protesters at the largest gathering at Bowling Green. 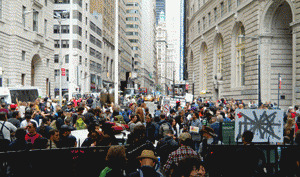 This includes hundreds of others were in smaller groups scattered throughout the Manhattan's financial district. The kick-off to occupy Wall Street was notable for who was there and who wasn't. Supporters from Anonymous, Code Pink, Socialist Party USA, the URPE, International Action Center, October2011.org, the Workers World Party, LaRouchePAC and at least two people supporting Ron Paul for President were represented. The majority, by my estimate 90%, were individuals who had traveled from all parts of the United States on their own dime, learning about the event from limited social media platforms. I identified representatives from: NJ, CT, PA, OH, upstate NY, CO, GA, FL, MA, and RI. From what I could gather the NYC representation was small. Representation from mainstream political and media organizations was non-existent or so insignificant I could not find them. 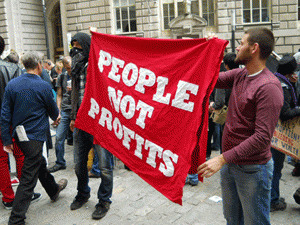 Occupy Wall Street Day 8: 100+ Arrested for Peaceful, Legal Protest; Nets & Pepper Spray Used.